Fred, co-founding Principal of Cushman & Wakefield | CRESCO Real Estate in 1991, has been in the real estate industry for over 30 years. Fred began his career as an industrial specialist with an international real estate firm in Cleveland, Ohio. While representing a wide variety of landlords and tenants, Fred has developed a reputation as a hard working, “plain speak” real estate consultant with the highest integrity. This has afforded him a long list of clients that he has consulted with, worked for and assisted over the years. The “Lou Gehrig” of real estate you might say. Fred’s areas of expertise include sales and leasing of commercial/industrial properties, consulting, tenant representation, development, build-to-suits, property valuation, research/surveys and land sales. Averaging approximately 60 transactions per year ranging in size 1,000 to 500,000 SF, Fred has been successful in developing and maintaining client loyalty, demonstrated by long standing relationships with landlords and tenants/owners. 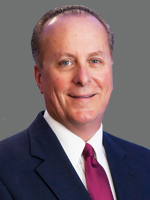 His alliance with Cushman & Wakefield has allowed Fred to provide these services on both a local and national level. Prior to Fred’s real estate career, he worked as a representative for Xerox Corporation marketing large, high speed duplicators in the corporate market. Additionally, he spent time at Bank One Corporation financing large capital equipment. Wholesale Supplies Plus, 7820 Pleasant Valley Road: Found investor to purchase a facility and do long term lease with Wholesale Supplies Plus. Filmore Properties, 12665 Corporate Drive: Found the opportunity to acquire the facility from a lender and located a buyer within the year to resell the property. 4550 NICKY BLVD 4550 Nicky Blvd. USER / INVESTOR COMPLEX 2450 Edison Blvd. ANTENUCCI BLVD. LAND Antenucci Blvd. ROCKSIDE RD. LAND Rockside Rd.